In fact, I’ll go so far as to say that anyone looking to write original fiction can learn quite a few things from giving fanfiction a spin. The caveats are that it will improve your writing only in specific ways and can make you think you’re a better writer than you are. In Part 1 of what will be a three-part post, let’s take the positives first. Writing anything is good if you’re trying to improve your writing. Like learning to play an instrument or to dance, writing only gets better with practice. Sure, reading is vital too, but reading is to writing what listening to a CD is to pounding out Tchaikovsky on the piano. Reading can show you what good writing is, but only writing can make you a writer. Fanfiction can also be a great way to bust through a bout of writer’s block and keep your writing muse happy when you’re too busy or tired to do original work, thus keeping your writing skills in practice and sharp. One of the hardest things about learning to write fiction is getting someone else to read your efforts. And even if you do get a friend or family member to read it, all you will have is feedback from someone who likes you, someone who is probably just going to say nice things. Before the Internet, getting strangers to give you honest opinions of your work meant paying them or paying for a class. Now all you have to do is post some fanfiction on a busy site, and presto! Sure, even strangers tend to be nice, but among the “Oh, that’s such a fun idea!” comments will be advice about your grammar, your characterization, your world building, your Mary Sue, and whatever else might not be working so great. Plus, once you get involved in a fanfiction community, you will probably find yourself writing feedback for others, which means you’re developing your ability to critique. That’s a skill you can then use on your own writing. Writers tend to be lonely creatures. We wander around, observing people and typing things into whatever portable typing thing we can afford (or just scribbling on paper). If we’re really lucky, we might meet someone who types or scribbles too. 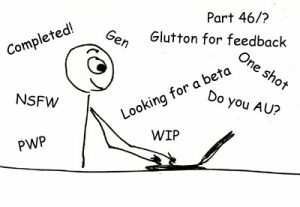 There are thousands of developing writers online, and fanfiction is a great way to introduce yourself. Many fanfic writers have moved into original character fiction and then into professional fiction. In fact, quite a few professional writers (myself included) find themselves writing fanfiction for fun. It amazes me when I hear people scoff at fanfiction for not being “real writing.” Is writing a script for a TV show not “real writing”? How about all those published novels based on Star Trek and Star Wars? How about the thousands of graphic novels that led to The Avengers? Are they now retroactively not “real writing”? Frankly, any written sequel in any genre does the same thing fanfiction does, which is to take an established situation and characters and put them all through a new adventure. Money is nice. (Very nice.) But it shouldn’t mark some line between “real writing” and whatever “fake writing” would be. 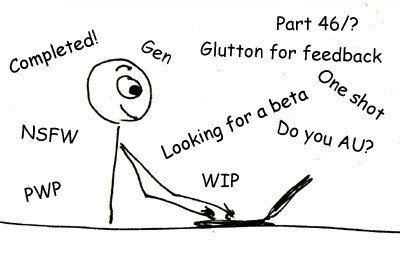 Considering I’m for an editing company, this is probably going to sound weird, but there’s nothing like a beta reader. This is a person who shares your passion about the movie/TV show/play/comic/book/whatever your fanfiction is based on; this is a person who’s actually rooting for your stuff to be good yet is (hopefully) not a close friend or family member. Good beta readers can be harsh at times, personal coaches who tell you honestly when you don’t stick the landing. Beta readers can have skills like checking your UK English (i.e., Britpicking) and vetting your grasp of canon. They can learn your style and tell you when it gets better. Best of all, because beta readers care about the movie/whatever on which your fanfiction is based, they’ll care about your fanfiction. You won’t just have a coach, you’ll have . . . well, a fan of your own. And wow. Look. I’ve talked about how fanfiction is good for you as a writer without actually talking about what it does for your writing. That will come in Part 2.